If you're in the market for a fireplace, no doubt you're attracted by the hearth design and the beauty of the flames. But, don't let visions of dancing flames and creamy stone mantels dim your decision-making. Here are a few important elements to consider when shopping for a fireplace. UL has been testing products for public safety for more than a century. Their standards are essential to ensuring safety, reducing costs and improving quality. Make sure your hearth is tested to UL standards. It's important that mantel clearances are deemed safe. Stains and lacquers should be heat-resistant. This ensures that they will not melt or bubble from the heat. A hearth system with a UL listing means that every component - from the fireplace to venting system to termination cap - is a perfect fit and is 100% compatible. You'll have the security of knowing your hearth system has been approved by the United States' most reputable safety organization. Don't buy a fireplace without the UL listing! Keep in mind that buying a reputable brand will save you time and money down the road. Direct vent gas fireplaces look just like traditional fireplaces; however, they solve some of the problems of their woodburning forerunners. Direct vent fireplaces take advantage of zero-clearance technology, which means they don't need foundations or chimneys. They burn efficiently, extracting most of their heat from the combustion gases. And direct vent gas fireplaces expel 100% of the unwelcome combustion gases and moisture directly outside the home. Venting is usually out through a wall or roof. Direct vent fireplaces are also easier and less expensive to install than masonry units. And you have greater flexibility for the hearth's placement in your home. Because of the burner's design, unvented fireplaces burn less authentic-looking fires. Codes in some parts of the country don't allow unvented fireplaces, so be sure to check out what is allowed in your area when making a decision which option to go with. Woodburning fireplace experiences evoke feelings of nostalgia for many homeowners with their unmistakable look, sound and smell. The design of today's woodburning fireplaces makes them more environmentally responsible than ever. Many models, like those in the Heatilator® Constitution™ line, comply with the strictest government air-quality regulations, and can even be used in communities that have imposed bans on conventional woodburning fireplaces. Electric fireplaces offer the ultimate in convenience and flexibility. You can enjoy a fire at the touch of a switch in any room you'd like. There's also no need for a chimney, venting, or gas line – simply plug it in! Minimal installation also means instant gratification. Take it home and enjoy the warming glow of an electric fireplace the same day. 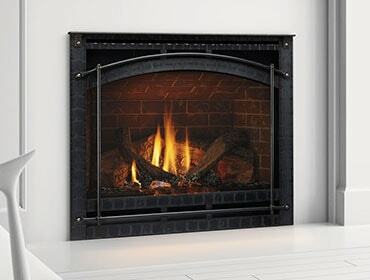 Most of us don't realize that gas fireplaces need annual tune-ups, just like other gas appliances. Manufacturers recommend that your fireplace be inspected and maintained annually by a qualified service technician. This ensures your appliance's continued safe and efficient operation. Technicians can perform a comprehensive inspection of your appliance and advise you of any necessary repairs. Hassle-free is the buzzword for today's fireplace enjoyment. Think about purchasing a service plan from your dealer when you buy your fireplace. Then you can sit back, relax and enjoy the fire.